Readers give it 5 stars! 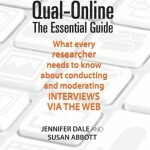 This new book by veteran marketers Jennifer Dale and Susan Abbott is full of fun facts, helpful tips, real-life case studies, and step-by-step instructions for carrying out any type of online qualitative research project. Get on-board and read what the best moderators are reading today: Qual-Online, the Essential Guide. Masterful, informative, and fun… Snag this book; you’ll laugh and learn your way into better online qualitative research. -Kendall Nash, VP, Senior Qualitative Consultant, Burke Inc.
After reading this book you will understand why ‘digital’ has the potential to transform qualitative research forever. This guide is a gold mine! I was surprised how much I learned chapter after chapter after chapter. Countless tips for the novice as well as the experienced online researcher… highly engaging read. Good read for all researchers out there looking to step up their Online Qualitative Research game! Informative and packed with ‘been there’ tips. All the tips and tricks for getting the most out of your qualitative research projects from A to Z!